It's safe to read Chris is on Infinite Earths again... tell a friend! Today's piece is covering a very new book... in fact, it's the latest issue of Flash (vol.5). At the risk of burying the lead... this might just be my favorite book of 2018 (so far). That said, I'm going to endeavor to be a little "lighter" on the spoilery synopsis... hate to fully spill the beans on a brand new book! We open with Barry and Wally standing in a barren wasteland as a lightning storm rages in the background. They're in a heated argument about saving "them". 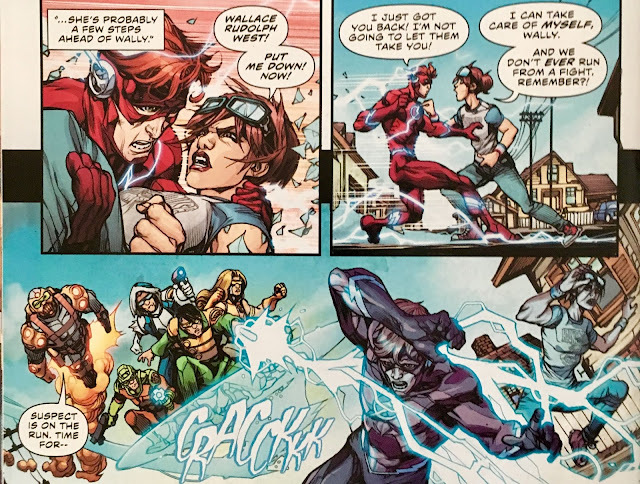 We then hop into a very recent flashback... like 47 minutes and 18 seconds earlier sort of flashback, and check in with Iris and the other Wally... guess we can call him "Wallace". Hopefully I remember that. 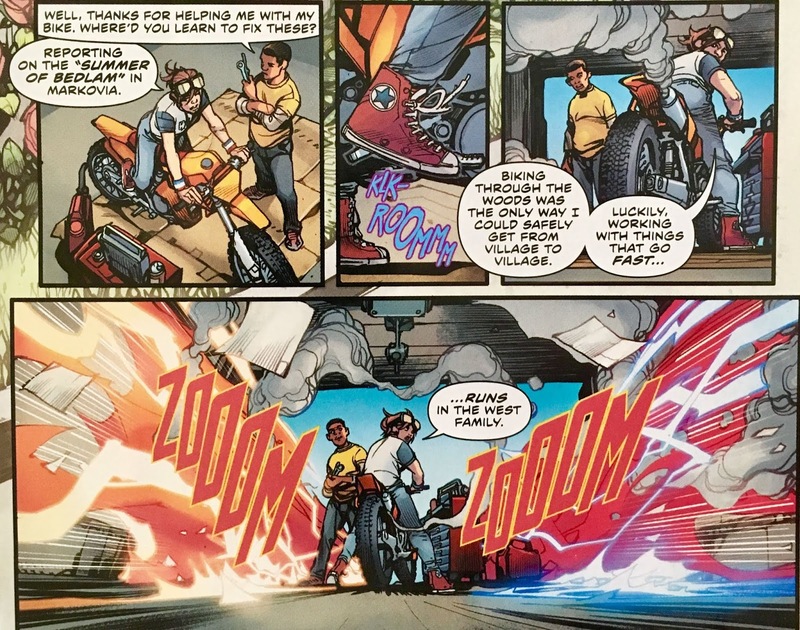 Anyhoo, Iris is repairing a motorcycle as they chat about the Flashes... then, speak of the devil, the Flashes arrive. Barry and Wally razz each other about their speed... Barry's always keen on taking the scenic route, while Wally is always zeroed in on the fastest. Worth noting, in case you haven't been following this run (ha!) 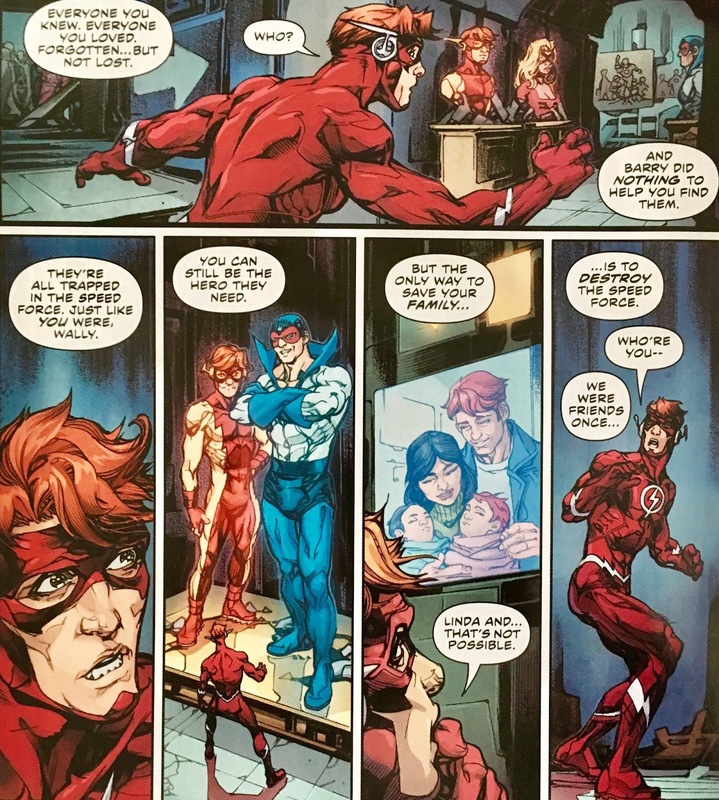 of Flash, Wally's memory is coming back, and he's finally come clean about who he really is to his Aunt Iris. 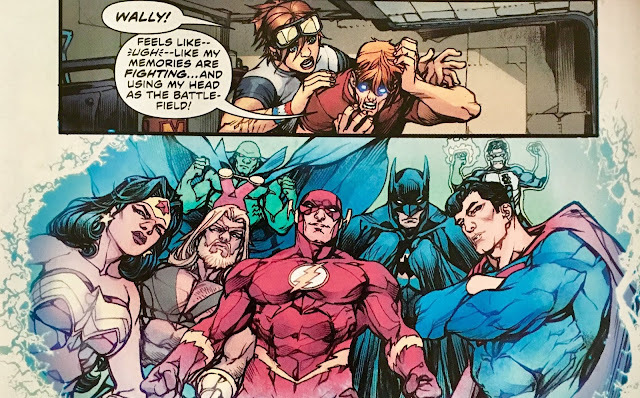 Speaking of memories... Wally is suddenly hit by a flood of 'em, including... get this, the "Magnificent Seven" incarnation of the JLA! As if my socks hadn't been rocked already! Just then, the Renegades from the 25th Century arrive in the present to arrest Iris West for the murder of Eobard Thawne! Heyyy, we know these folks! 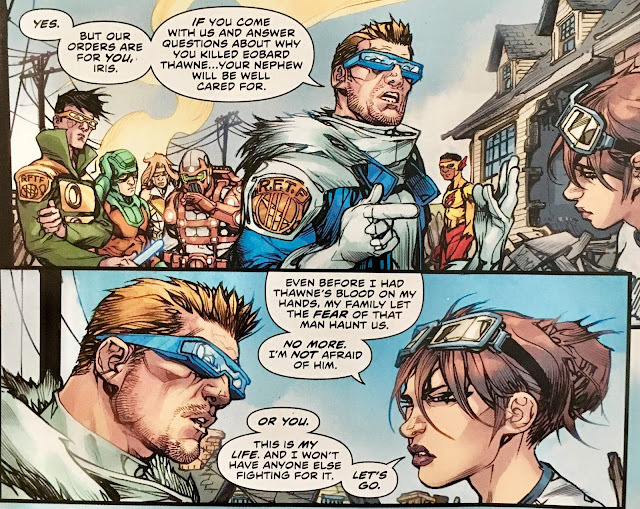 Barry however, doesn't recognize them... which is something that doesn't surprise Commander Cold all that much. Wally refuses to listen to the Renegades and instead scoops Iris into his arms and skedaddles. Barry and Wallace give chase... as do the Future Cops. Iris insists Wally put her down so they can face whatever this is head-on. 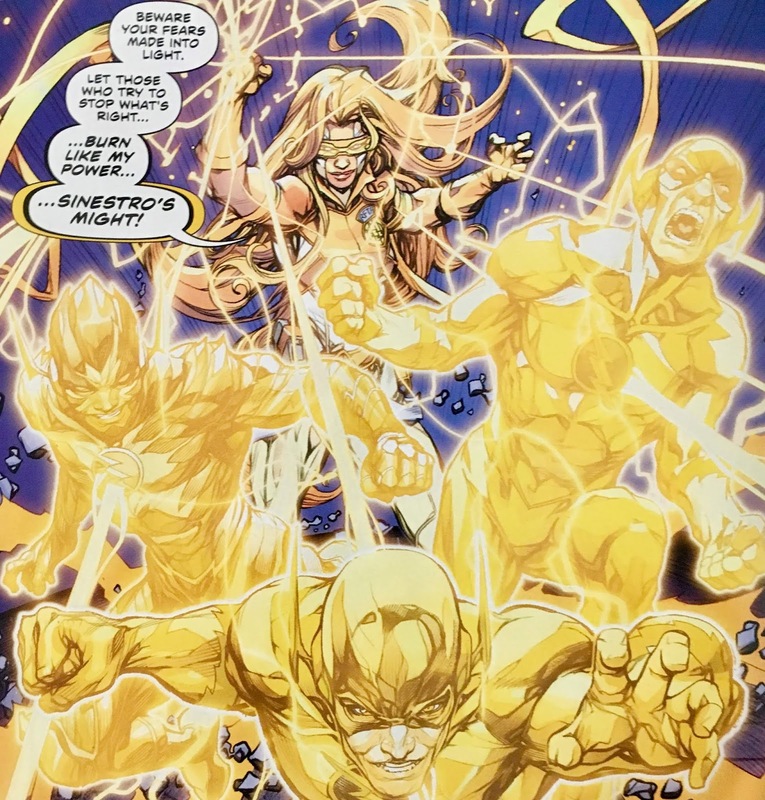 Just then, the Golden Guardian recites a familiar Oath... revealing herself to be a... Yellow Lantern?! After several pages of fighting Yellow Light Constructs and Inter-Flash-Family arguing, Wally goes down to another memory jolt. Commander Cold notices this, and orders his team stand-down. He recognizes Wally's malady as a "temporal seizure"... and says he can help him, so long as Iris comes back to the 25th Century willingly. 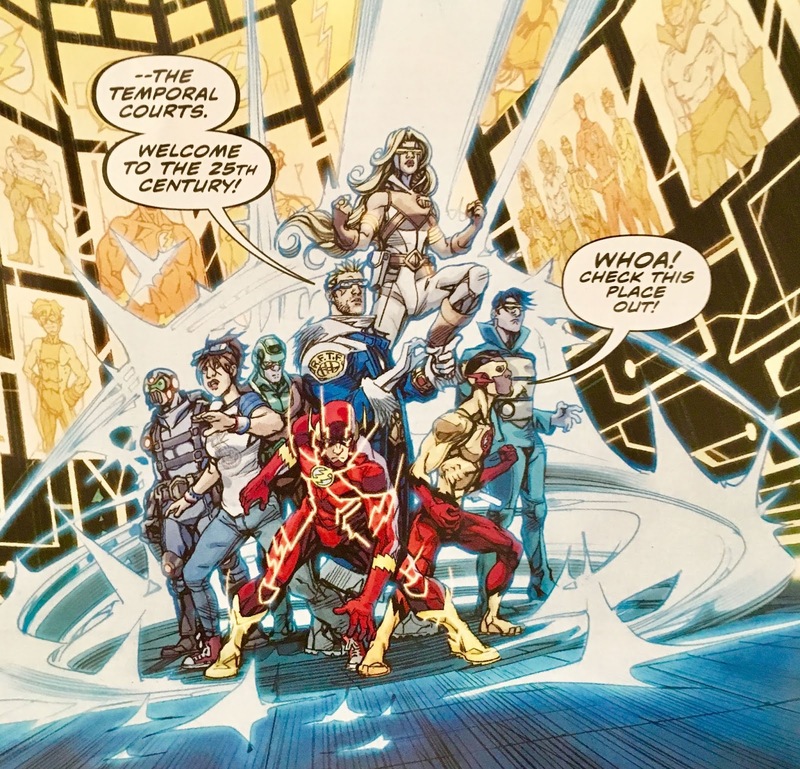 The whole Flash Family agrees that this is the best course of action... and they decide to accompany her... to the Temporal Courts! Lookit, lookit... it's Impulse! And Max Mercury! Jesse Quick! Barring one giant omission, it's the entire Flash Family! Also, Wally doesn't appear to have made it! He somehow winds up at the ruins of the Flash Museum... where he sees a whole lotta delicious pre-Flashpoint stuff... including he and Linda... holding a pair of babies?! 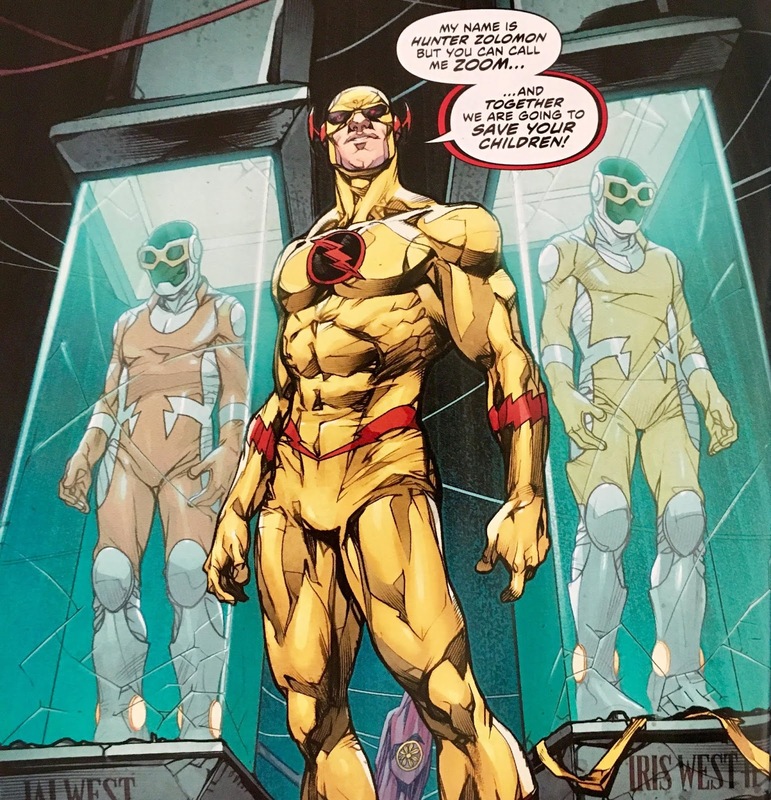 We wrap up this chapter with Wally stood before the man who seems to have brought him here... Hunter Zolomon... ZOOM. Behind him are the costumes of Wally and Linda's children, Iris and Jai West! 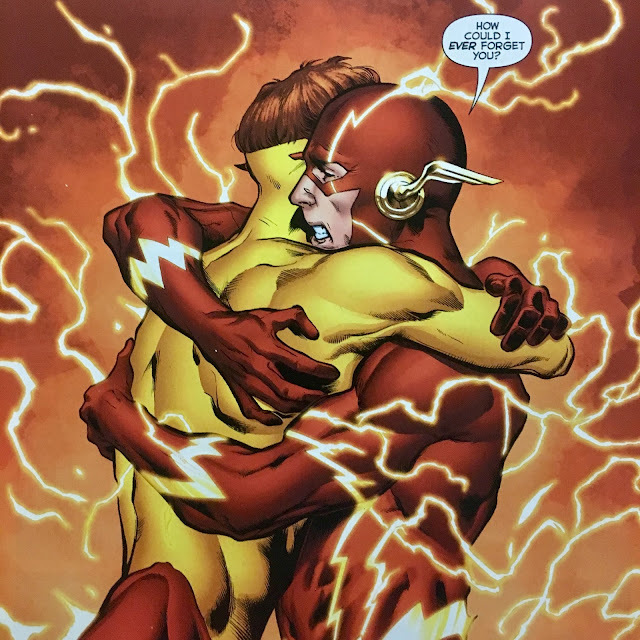 Um, by now y'all know that I'm a pretty soft touch when it comes to comics... particularly, for some reason, Flash comics. I still can't get through that scene in Rebirth... hell, I can't get through Geoff Johns describing that scene in Rebirth! This gave me a very similar feeling... a true testament to the talents of this creative team. Just... man... just great stuff. And... ya know, I'm not just gushing because they're telling the story I've wanted to read. It's more than that. It's that Williamson is using the past to craft the future. This is the way comics should be done! You play the ball where it lays... and you don't just flush away everything that came before... or anything you find inconvenient. I love that we're getting bits and pieces from just about every run (ha!) of the Flash here. 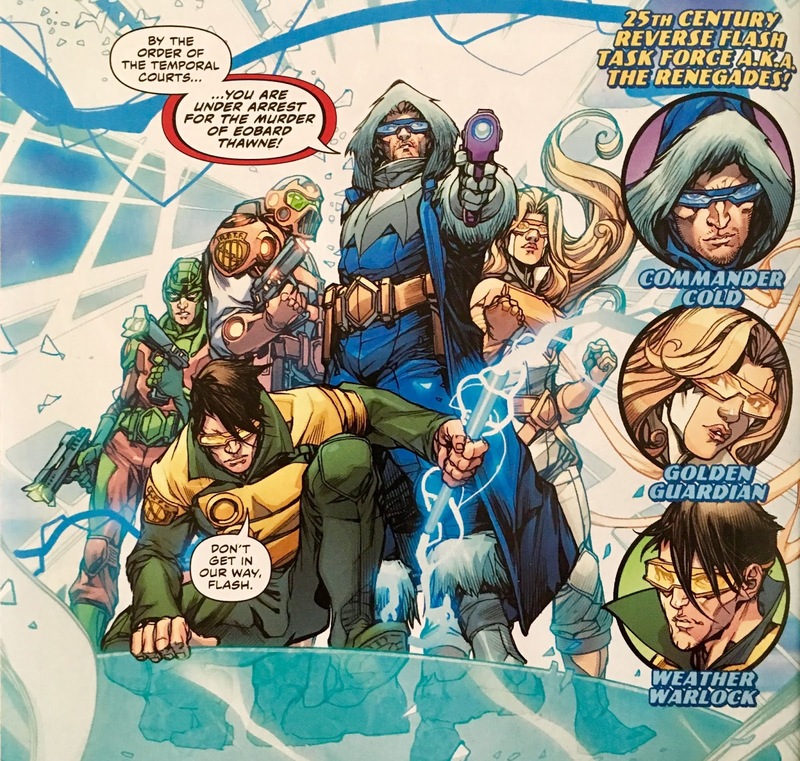 Iris' 25th Century origins... the Renegades... even Jai and Iris (who I really didn't care for when they were introduced). So many questions we had from Rebirth-on are finally getting answered. At this point, I'm on board for just about anything. Even if this somehow wipes certain things out... at least it's being addressed and done in-story... rather than in a boardroom. I mentioned a giant speedster omission during the synopsis... and that is, of course... Jay Garrick (who we haven't seen since The Button)! Gotta assume he's either going to be a big reveal... or they're waiting on some Doomsday Clock-related thing to reintroduce him. Either way... I'm on board... and cannot wait to see how this unfolds! The art is also fantastic! I mean, we actually get a panel of Howard Porter drawing the JLA... his JLA. I had to blink a few times... couldn't believe I was seeing the hook-handed Aquaman! Just so cool. Overall... I haven't been this happy reading a comic book in a lonnnnnnng time. Highest possible recommendation. 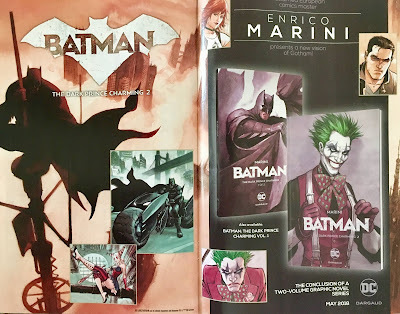 I read this issue this week and loved it. 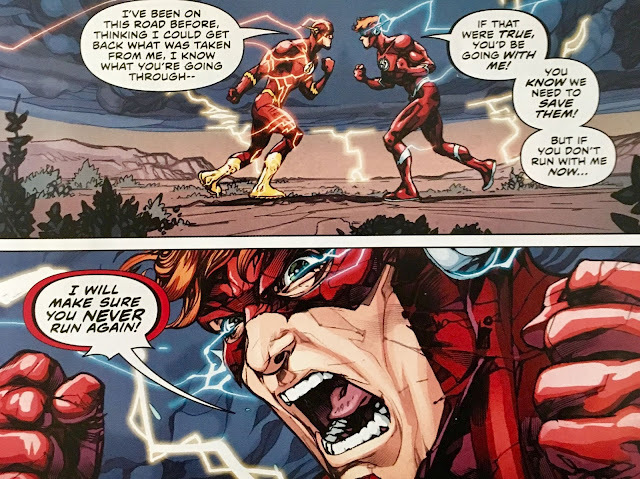 I am nowhere as familiar with pre Flashpoint Flash as you are, and missed a couple things you pointed out, I still thought it was a great issue. Howard Porter's art was outstanding. For me it can't be the best book of the year so far. That goes to either Superman 45, or 44 (where Bizarro Boy looks so sad when his dad leaves and Suoerboy and Superman decide to bring him home, might be 43). 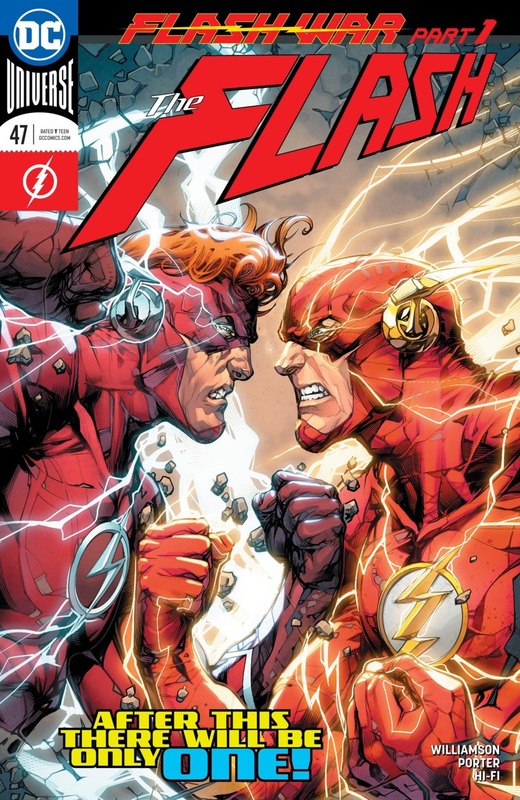 This issue has got me looking forward to the Flash war story. How awesome would it be if Jay Garrick came back in this event!